More contemporary writers select the works of Jane Austen to adapt than any other author. In this latest Austen variation, crime writer Lona Manning selects Mansfield Park as her subject. Like many others, Manning considers Austen’s Fanny to be too “insipid” a heroine to inspire reader interest. Thus, she alters the story beginning with Austen’s play scene in Chapter XV. (The book offers a brief synopsis of earlier scenes for those unfamiliar with the original.) Manning retains Austen’s characters, namely: Henry and Mary, the visiting, unscrupulous Crawford siblings; and Edmund and Tom Bertram and their sisters, who live at Mansfield Park with their mother and irascible aunt. Also living at Mansfield Park is Fanny, a shy poor cousin who is constantly harassed by her visiting aunt. When Manning’s Fanny finally decides to seek her independence by becoming a governess, she leaves Mansfield Park without disclosing her destination. This causes some to worry and others to berate her ingratitude. As Fanny slowly embraces her new life and becomes a fully fleshed and sympathetic character, Henry Crawford’s dissolute life intensifies, and his sister plots to attract Edmund’s attention while also disparaging Fanny’s character after intercepting fond letters between Edmund and Fanny. Manning incorporates into her narrative growing public opposition to the slave trade which maintains Mansfield Park and expands the role of the navy and Fanny’s seagoing brother. A Contrary Wind is an impressive feat. 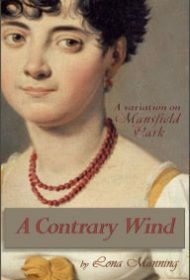 Manning not only emulates Austen’s writing style so well that she often seamlessly incorporates exact passages from the original into her narrative, she also retains the claustrophobic pettiness of the upper class while setting the novel securely in its political and social context. The author creates engrossing tension through the escalating misdeeds of the Crawfords, whose just punishments will meet with modern approval. Many try to emulate Austen; not all succeed. Here, Manning triumphs. She has retained Austen’s spirit, while providing a stronger Fanny who will surely win today’s readers.